If you are a home or business owner, you understand that when your roof becomes damaged or needs replacing that it needs to be done fast. Allowing a damaged or outdated roof on your building can result in a bill much larger than if you were to replace it fully, as other damages can accrue as a result of the roofing’s integrity. Because of the inherent need to fix a roof as soon as it is proven unsound people tend to rush to get their roof fixed, contact ing the first roofing company that they find, or the roofing company that they have most previously worked with. At Nice Shingles Roofing & Exterior we understand the value of quality and lasting roof replacements and are willing to do whatever it takes to get your roof replacement or roof repair done in a timely manner so that you can get back to your life. For a number of reasons, you might find yourself needing a new roof. Whether it be a result of an extreme weather event like hail or ice dams or simply from old age, it is important to ensure that your home or business has a functional roof. When a Nice Shingles Roofing & Exterior client asks us to conduct a shingle roofing installation or a metal roofing installation, we use only the best construction materials to do so. Additionally, every GAF roof that we install comes with a non-prorated 50-year warranty. When we replace a roof, we understand that it affects our customer’s life, being why we will quickly and efficiently complete the job so that you can get back to your life. If you need a new roof installation, please don’t hesitate to contact us. While the need for a roof replacement is much easier to predict, roof repairs often are needed as a result of an unpredictable circumstance. Storms can become quite intense in the Stroudsburg and Poconos areas, with hail, wind, ice, and falling branches all contributing to the damage of roofs. If your roof is damaged in a storm we urge you to contact us at Nice Shingles roofing & Exterior to request a roof inspection where we can quote your roofing repair costs. For many reasons, your roof and attic might not have the proper ventilation. Ventilation is an essential factor in increasing the lifetime and structural integrity of your roof, as moisture can accumulate in the attic, creating mold and structural damage if the space is not properly ventilated. 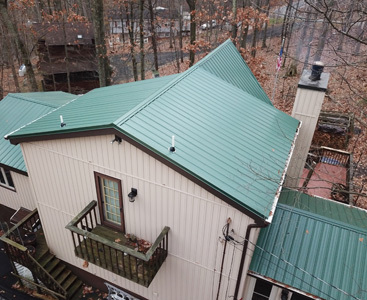 At Nice Shingles Roofing & Exteriors we want to be known as more than just a re-roofing company in the Stroudsburg and Poconos areas, as it is not our intent to fix your roof if we can prevent you needing a roof replacement in the first place. At Nice Shingles Roofing & Exteriors we offer a number of roofing services, both preventative and responsive so that the last thing that you need to worry about is the integrity of your roof. If you are currently experiencing an issue with your roof, or suspect that you are, contact us today to request a roofing inspection. One of our experienced roofers will come to your home and provide you with a quote for your roof replacement or roof repair. We look forward to working with you and allowing you to regain some peace of mind!